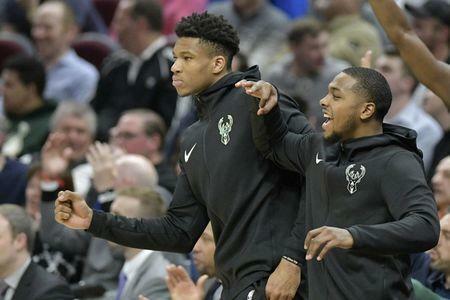 The Milwaukee Bucks played without All-Star forward Giannis Antetokounmpo for a second consecutive game Wednesday night as he continues to nurse a sprained right ankle. Antetokounmpo, a candidate for MVP, did not play in the Bucks' road game against the Cleveland Cavaliers on Wednesday. He also missed Tuesday's victory over the Los Angeles Lakers, who were without their own superstar, LeBron James (sore left groin). Bucks coach Mike Budenholzer said of Antetokounmpo before Wednesday's game, "He's making progress, he just can't go tonight. It's us hopefully being smart and being somewhat cautious, but it's more than that. He can't play. We'll see how the next 24-48 hours go, and I'm hopeful he'll be in a good place as we move forward." The NBA-best Bucks (53-19) fell 107-102 to the Cavaliers, who own the third-worst record in the league at 19-53. Milwaukee returns home Friday for a game against the Miami Heat. --Bucks power forward Nikola Mirotic will miss two-to-four weeks with a "slight fracture" of his left thumb, Shams Charania of The Athletic reported. The Bucks acquired Mirotic from the New Orleans Pelicans at the trade deadline to provide depth off the bench. The team confirmed the injury but did not update his status. Since the trade, Mirotic has played in 14 games (three starts), averaging 11.6 points, 5.4 rebounds and 1.4 assists in 22.9 minutes per game. Mirotic sustained the injury in the Bucks' 115-101 victory over the Los Angeles Lakers on Tuesday. The injury likely will keep him out the rest of the regular season. --The NBA Summer League will have an international flavor in 2019, as the Chinese and Croatian national teams will join all 30 NBA teams in participating in the league, which will be held July 5-15 in Las Vegas, the NBA announced.